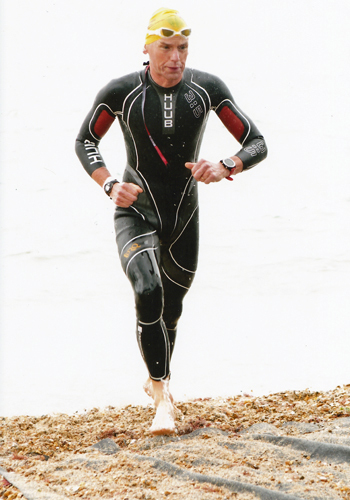 Having done 15 Ironman branded long distance races, it was time to try a Challenge branded event. 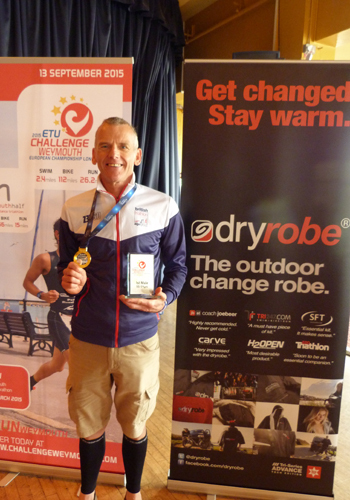 The added incentive was that Challenge Weymouth was not only an open race, but it was also this year’s official European Triathlon Union’s Long Distance Championship, which, having qualified, would mean that I would be racing in GB colours for the first time. After the usual pre race day preperations of bike racking and a sleepless night, it was back to T1 for a last minute bike check and to prepare for the swim. Unfortunately, just before it was time to put the wetsuit on, it started to rain, which meant we were all cold and shivering and that was before we had got in the sea. The hooter started and we were all into the sea. Unfortunately, half way through the first lap, I swam over a large jelly fish and was stung on both wrists which was a bit painful, but I managed to stay focused. By the time we went back in for our second swim lap, the wind had got up and the sea had become a lot more choppy; it was more difficult to see the marker buoys, so I was relieved to get out of the water after a steady swim. 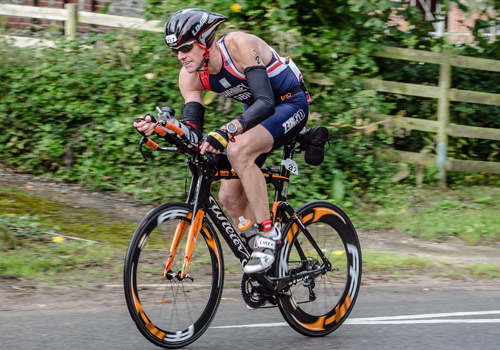 Onto the 2 lap bike course, I managed to get into a fast pace straight away and tried to keep my cadence steady and make sure I didn’t push too hard, but at the same time, try to catch up with people in front of me. It was an undulating course, with a few tough climbs, but was made harder by the strong wind, especially on the second lap. After an uneventful 2 laps, I was soon back into T2 and on to the run. The run involved a 4 lap run along the promenade, which on a normal day, would lead to fast times, but there was a really strong headwind, which made for a tough outward leg, and the discomfort of having sand blasted into your face made for very uncomfortable conditions. Having a large number of GB team members on the run course cheering you on, really helped in the second half of the run when I started to get very tired. It was a relief to get to the finishing chute and be handed a union jack flag on the run in to the finish line. I felt very proud and privileged to have raced for my country and there was no doubt that it spurred me on. The added bonus, was that I had finished 1st in my Age Group overall as well as first in the European Championship and duly received my European Championship Gold winners medal at the presentation the next day.